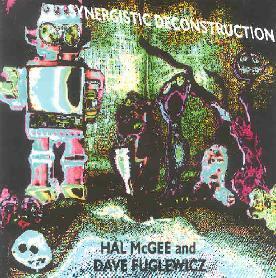 Hal McGee and Dave Fuglewicz - "Synergistic Deconstruction"
On Synergistic Deconstruction, Hal McGee teams up with Atlanta, Georgia based sound artist Dave Fuglewicz for 2 lengthy tracks of cosmic electronic space chaos. First up is the 31 minute "Dislocated Chronicles", which combines drugged dance grooves, clatter percussion, drunken melodies, Tangerine Dreamy electronica and screaming, whining, shooting synth lines. This is ultra spacey stuff, but presented in a chaotic collage-like kind of way. There's a powerful 50's sci fi flick element, with the soundtrack from the big battle of the electro monster scene at the end of Forbidden Planet coming to mind. But we also get an array of tripped out electronic pandemonium thrown into the stew, along with lots of noise and voice samples, though the noise elements are relatively low on the aggression scale. Definitely a journey-into-sound piece of a cosmic but avant-garde nature, and with a HIGH level of energy that communicates edge-of-your-seat intensity. Imagine a batting cage and you've set the machine to it's fastest rate of pitching and the balls are flinging at you faster than you can swing your bat. Hal and Dave are pitching freaky sounds into your brain pretty much like that. The mood changes a bit in the last several minutes when the volume and pace ease up and a crazed concert piano and carnival like keyboard melody take center stage, bringing the piece to a playfully musical close. The 46 minute title track opens with tribal percussion that adds a steady groove to the music as eerie synth lines weave a winding path and noisey textures create a grating edge that isn't painful but certainly kept me alert. It's all fairly low-key and emphasizes the cosmic elements beyond that heard on "Dislocated Chronicles", making much of this feel like Tangerine Dream given the Hal styled sound collage treatment. But don't think you can sit back for some relaxing mind expansion because there's way too much happening for that. While it may be high on the space meter there's still a parade of drones, meteor shower tones and adrenalin pumping activity to keep your senses on full alert. There's lots of fun parts that last a few minutes and then move on, a particularly enjoyable bit featuring a trio of crazed boogie piano, full throttle pulsating electronics and off-kilter Dub beats. Overall a great mixture of avant-garde sound collage and cosmic space electronics. Visit the Dave Fuglewicz web site at: http://webpages.charter.net/davefuglewicz.